On installation, they appear within the imaging program, listed in the filters menu. Most of the effects alter the underlying colors that define the image. For instance, you can invert colors without making the image into a negative, or simulate red/green color blindness. The interface varies, depending on the filter. Some are simply one-click effects, with no dialog or user controls. Others have a dialog with a nicely resizable preview window that can be magnified to 100%, which can help you judge how the filter will effect details in your picture. Within those dialogs, the options are generally limited. Some have only a single slider. 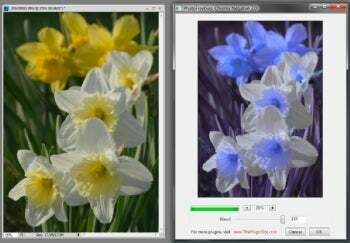 However, the one for converting color pictures to black and white has several options, simulating various real world photo filters in B&W photography. While we aren't greatly impressed with Photofreebies, the fact is that they are free and take up very little space on your computer. So check them out. After all, it is just possible that one of them may provide exactly the effect you want for a specific image.